Our first public release of ggvis, version 0.3, is now available on CRAN. What is ggvis? It’s a new package for data visualization. Like ggplot2, it is built on concepts from the grammar of graphics, but it also adds interactivity, a new data pipeline, and it renders in a web browser. Our goal is to make an interface that’s flexible, so that you can compose new kinds of visualizations, yet simple, so that it’s accessible to all R users. ggvis integrates with Shiny, so you can use dynamic, interactive ggvis graphics in Shiny applications. We hope that the combination of ggvis and Shiny will make it easy for you to create applications for interactive data exploration and presentation. ggvis plots are inherently reactive and they render in the browser, so they can take advantage of the capabilities provided by modern web browsers. You can use Shiny’s interactive components for interactivity as well as more direct forms of interaction with the plot, such as hovering, clicking, and brushing. There’s much more to come with ggvis. To learn more, visit the ggvis website. 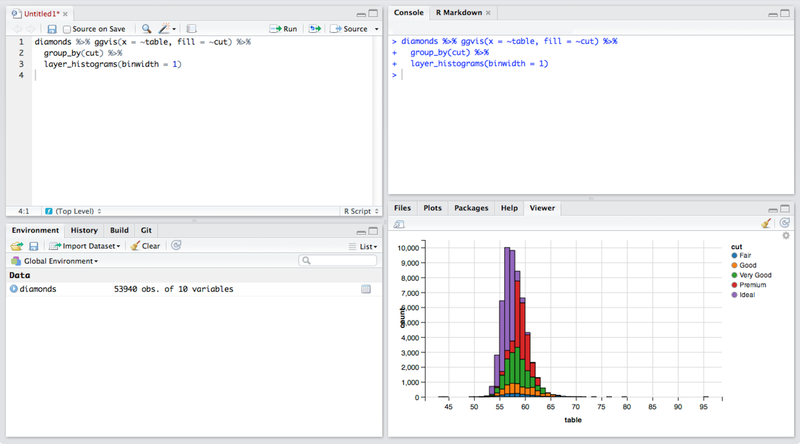 Please note that ggvis is still young, and lacks a number of important features from ggplot2. But we’re working hard on ggvis and expect many improvements in the months to come.